Fonq is an online store specialized in living, cooking and lifestyle products. Based in the Netherlands, it also operates in Germany, Belgium and France. With 200 employees and more than one million unique visitors a month, it counts among the biggest players in its industry. Fonq started using WisePops to create email opt-in campaigns. They wanted to be able to retarget new visitors who didn’t purchase during their first visit. FonQ set up the campaign to display to new visitors on the homepage. This popup allowed Fonq to turn 3% of new visitors into subscribers. Overall the campaign helped them collect 800 extra opt-ins/month (yep, that’s an extra 9,600 subscribers/year). 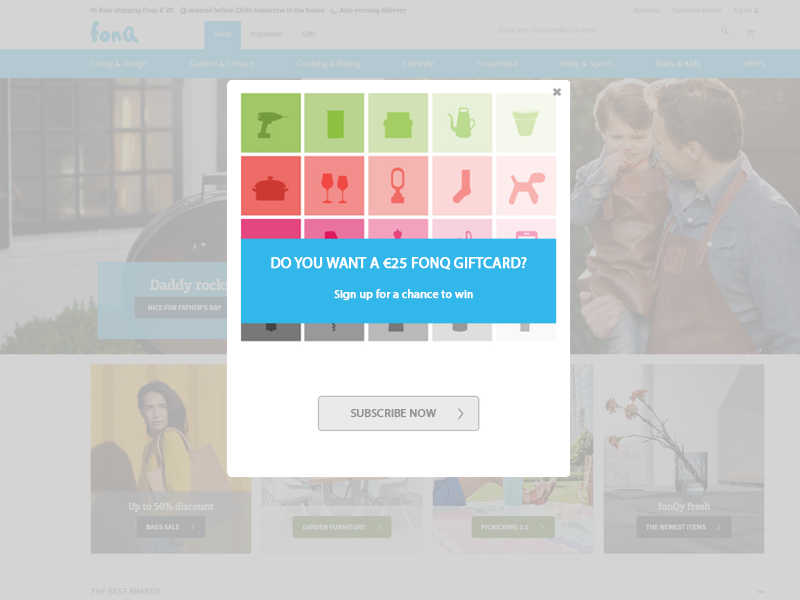 Fonq then decided to use popups to promote site-wide promotions. WisePops allowed them to design and publish a popup to promote a coupon in just a few clicks. Displayed on landing to all visitors, the campaign was highly visible. 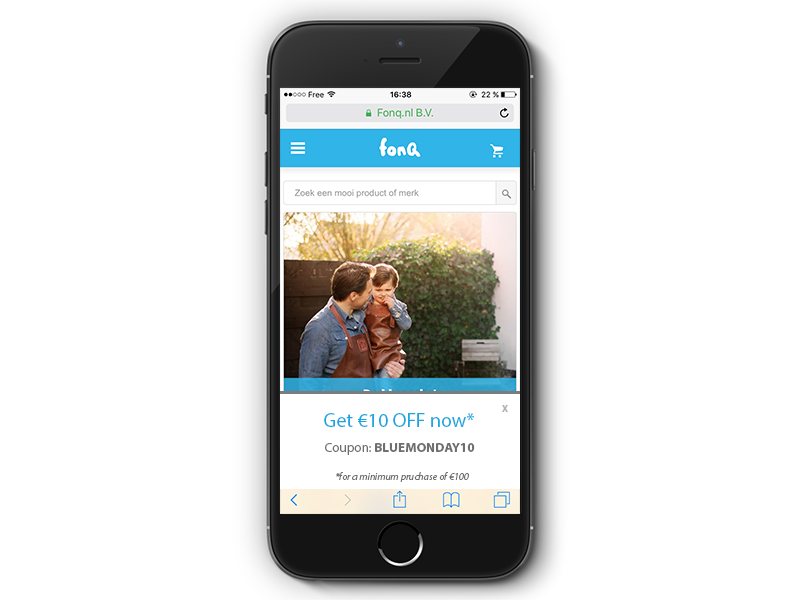 The results were impressive: combining a popup campaign and a coupon, Fonq noticed 15% uplifts in the conversion rate on the day of the campaigns on average. Since then, Fonq has used the same type of popup to drive traffic to specific categories of the website offering a discount applicable only to some products of the website. They are still evaluating the results of these operations. In the beginning, we were looking for a popup tool, easy to use and easy to implement, with the possibility to define some smart rules. First, we used it to generate new opt-ins for our newsletter, but now we use WisePops to promote big discount promotions. We use WisePops to promote big shop-wide campaigns, like a €10 discount campaign or to promote our gifts during the Christmas period. With the tool we can set the pages where we want to display the popup but also set pages we want to exclude (e.g. pages of excluded brands in this discount promo). WisePops also allows us to create mobile friendly pop-ups. You have strong conversion rates on some of your campaigns, what did you do achieve this? 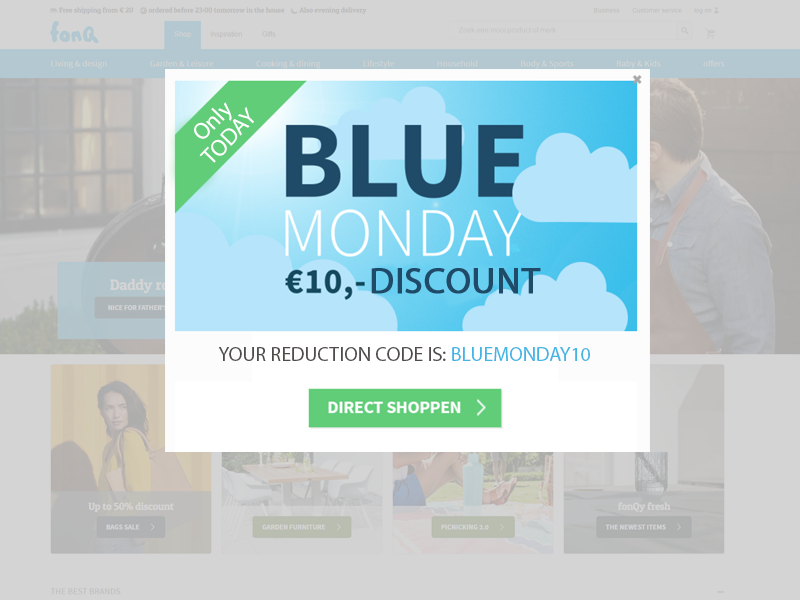 I think the discount (€10 off) is the main reason, but WisePops’ advanced targeting options also played a part by allowing us to show our visitors our best offer easily. Did you find installation and utilization of the tool easy? We installed the tool via Google Tag Manager in just a few clicks and use WisePops every day without any problem. What advanced features have made the most difference for fonQ? How have results from WisePops impacted your business? When we run a big discount campaign combined with using WisePops popup tool, we can expect a conversion uplift of around +15%. We are happy with the end results and we see WisePops as an easy way to promote our best offer during those campaigns, on specific landing pages or devices.